The study of Indian achievements in the field of sciences received an encouraging start when some renowned scientists, such as B. N. Seal and P. C. Ray, chose to work on these topics. Benoy Kumar Sarkar appreciated' the significance of such a study for providing the proper background to the history of Indian society. 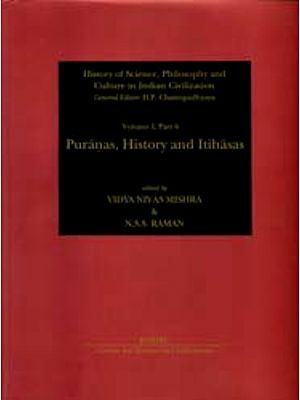 No doubt, A Concise History of Sciences in India has been prepared through the combined efforts of several scholars and our knowledge of many aspects of the history of Indian sciences and technology has been enriched by papers and monographs contributed by scientists and historians alike. Without trying to belittle the value of these studies, one cannot help lament that India could not get in all these years a Joseph Needham to write its history of Science and Civilisation. It is a difficult task, ordinarily to be accomplished by a team of scholars working over long years, and requires a sound knowledge of many languages, a grounding in the history of the society or country, a training in historical methodology' and a close awareness of the theory and practice in different branches of science and technology. A man combining these qualities and endowed with enduring patience and a keen sense of dedication is rare. We wish scholars working in areas of their own interest in due course of time provide material for some competent person to synthesise it into a systematic pattern and a connected narrative. There is enough evidence to indicate that Indian achievements were of outstanding merit. We can get some idea of their nature by analysing the ancient objects that have survived down to our times. For a clearer understanding of the scientific theories and their practical implementation we have to study the ancient texts on these subjects. A major part of the large fund of knowledge, preserved in 'closed' schools through teachers and their students or artisans-craftsmen and their apprentices, is not immediately available to us, but enough has survived in the ancient texts. Unfortunately not much has been done to rescue these manuscripts from oblivion and to prepare critical editions for their proper evaluation. The information in some of these texts is couched in idioms and terms difficult to understand. But, generally they are presented in simple Sanskrit which, at times, suffers from grammatical mistakes and cumber- some expressions. Some pieces of scientific information are projected as being the result of mystic realisation on the part of seers and sages or divine revelation. We do have indications that a few branches of science and technology had provisions and facilities for experiments, howsoever rudimentary they may appear according to modern standards. Though experiments in laboratory conditions did not operate in an appreciable manner, knowledge was often acquired through long observation. The present text collects weather-maxims which were used for foretelling rainfall. Along with some other texts of a similar nature, it was the precursor of the weather-maxims of vernacular languages. This shows the continuity and antiquity of the tradition of scientific knowledge being preserved for popular use. With all the sweeping remarks about agriculture in India being a gamble in rains, the common villager finds the weather-maxims of ready help. We realise the need for a scientific check- up of the reliability of the weather-maxims and their comparisons with the vernacular versions. But these attempts have to be second in the order of sequence. As usual, my manovrttanusarini patni, Dr. Smt. Krishna Kanti Gopal, through her exemplary and sacrificing patience, has helped me complete the present small study. Dr. Murli Dhar Dubey has checked some references and Sri M. C. Joshi has read the proofs. The Tara Printing Press is also to be thanked for its cooperation. The monograph could never have been printed if Sri L. C. Patni, Finance Officer of the University, had not helped in restoring the grant of the Department, which, after lapsing for two consecutive years, had been reduced to a notional existence in the Budget of the University. Last, I have to pay my regards to the renowned Sanskrit scholar, Dr. Gauri Nath Shastri, Kulapati of the Sampurnanand Sanskrit University, Varanasi, for very kindly permitting me to edit the manuscript available in the Saraswati Bhavan Library of his University and to publish my studies on it. The Gurusamhita is one such text on climatology and weather-forecasting. It has not been printed so far and is known through a single manuscript (No. 34725) in the Saraswati Bhavan Library of the Sampurnanand Sanskrit University, Varanasi. It contains 61 sheets of the size 6" x 8.2". The credit for bringing this text to the attention of scholars goes to Dr. Dhunirama Tripathi. Earlier studies on the subject, including Agriculture in Ancient India published by the Indian Council of Agricultural Research", and Maya Prasad Tripathi's Development of Geographic Knowledge in Ancient India, do not take any notice of this manuscript. Dr. Tripathi in his doctorate thesis (for Vidyavaridhi)' quotes profusely from this manuscript to describe the development of the science of climatology in ancient India. But he does not subject it to a critical analysis to determine its age and authorship. He makes casual references to the faulty readings and ungrammatical formation of words and expressions. At places he observes that similar information on a given point is to be found in a number of texts, the Brhatsamhita, Krsiparasara, Mayuracitraka, Meghamala and Vanamala, but does not attempt a comparative study of the verses in all these texts to identify common verses and to determine borrowings and sources of borrowings. The noting on the manuscript says that it is a complete text. At the end of the manuscript we have a clear statement that 'the text comes to an end'." As was the practice with some copyists, at the end of the manuscript we have five verses about predicting success or failure (karyasiddhi) as a result of questions asked. Finally we have the date of the copy and the name of the copyist. But the text has a very abrupt beginning. There is no reference to the name of the text. The title of the first section is also not indicated. The introductory verses, which would have presented the background, are not to be found. One would expect a reference to the situation in which the text was recited or dictated. In the text the verses, clearly imply two stages of narration. The first is when Siva narrated the text to Parvati. The second is when Garga told it to Indra. In the text these two layers of narration are not very clearly brought out. An analysis of the text does not leave any doubt about it, though we face difficulty when we start separating the two layers. From verse 2 we get words which indicate that the verses were addressed to Parvati." Likewise, verse 400 is the first to show that Indra (Devarat) is being addressed. The normal practice with Sanskrit texts, Smrtis, Puranas or technical works, is that the introductory verses bring out the background and state how the text came to be composed, who addressed whom, and in some cases, when, why and where. Considering the statements in later parts of the text, we would have expected in the text first a reference to how Garga started narrating the information to Indra. In the course of his narration Garga would have poind out that earlier all this information was communicated to Parvati by Siva. D. R. Tripathi mentions this text as the Gurusamhita. The name appears on the title page of the manuscript. But it does not occur in the colophon or any other part of the manuscript. The name Gurusamhita is not known from any other source. In the Brhatsamhita and Bhattotpala's commentary the name of Guru is conspicuous by its absence though numerous authorities on astronomy and weather- forecasting have been named. Elsewhere also we do not find Guru as the name of any ancient scholar or author. The question, then, is: who is this Guru and why the text has been named as the Gurusamhita. The original meaning of the word guru as an adjective is heavy, weighty, great, important, valuable and venerable. It is also used for any venerable or respectable person, father, mother or any relative older than one's self. In the Smrti literature" the term guru is applied to a spiritual parent or preceptor 'from whom a youth receives the initiatory Mantra or prayer, who instructs him in the Sastras and conducts the necessary ceremonies up to that of investiture which is performed by the Acarya'. Among the Saktas the term is used for the author of a mantra. In the Bhagavata Purana Guru is the name of a son of Samkrti. In the Indian tradition the adjective guru has been applied preeminently to certain Individuals. Drona got this .appellation as the teacher of the Pandavas and Kauravas. Prabhakara, the celebrated teacher of the Mimamsa system of philosophy, was also known under this designation. Brhaspati, as the preceptor of gods, is respected as, Guru. In the Mahabharata Guru is once used to refer to Siva. Of these, Drona, Prabhakara and the son of Samkrti do not have any credentials to be identified with Guru after whom our text is named as the Gurusamhita. The association of the name Guru with Siva receives support from the fact that information in the text is stated to have been originally communicated by Siva or Bhairava to Parvati and then Garga reported it to Indra. Thus, the text would appear to have been named as the Gurusamhita because Guru or Siva originally narrated it. But this interpretation is not very convincing. If the author wanted to impart to the text the prestige of the association of the name of Siva, he would have chosen a direct name and would not have used such a veiled, indirect or comparatively insignificant appellation . However, we may also note that the text appears to have made 'many borrowings from the Rudrayamalatantra, It may not be unreasonable to suggest that the author of the present text in compiling it wanted to emphasise this particular nature of its verses and hence designated it as the Gurusamhita. It may be tempting to read in the name Guru a reference to Brhaspati, the preceptor of gods. It is to be noted that after verse 212 of the text we have a reference's to a chapter on dharana in the Brhaspatisamhita coming to an end. 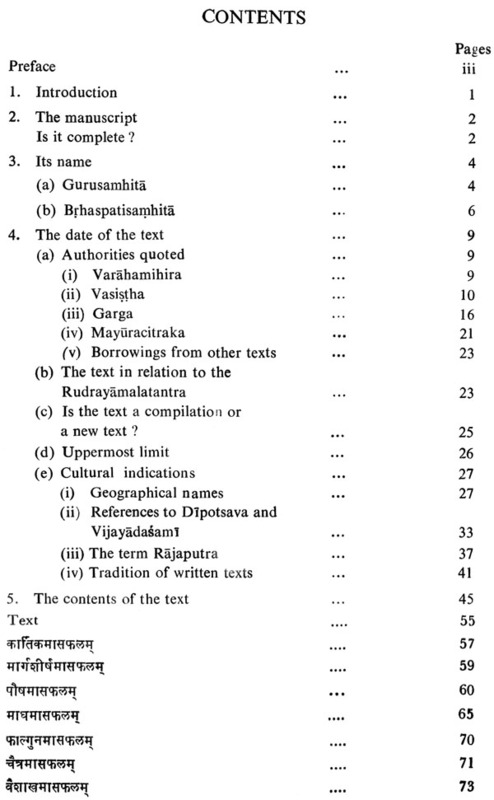 It would appear that the text was divided into a number of chapters and that whereas the colophons to other chapters have been dropped out, the one surviving in the present case is important in indicating that the name of the text was the Brhaspatisamhita; Brhaspati being the name of the Guru of gods the text was also named as the Gurusamhita. The fact that the text contains long passages recording the views of Garga as communicated to Indra can be construed to support the connection with the name Brhaspati in place of Guru as Garga belonged to the family of Brhaspati. In Indian tradition coming down from very early times Brhaspati is respected as one of the holy sages (rsi). He is credited with having brought out a compressed version of the major work on dharma, artha and kama which originally Brahma had composed." He was a reputed authority on arthasastra. 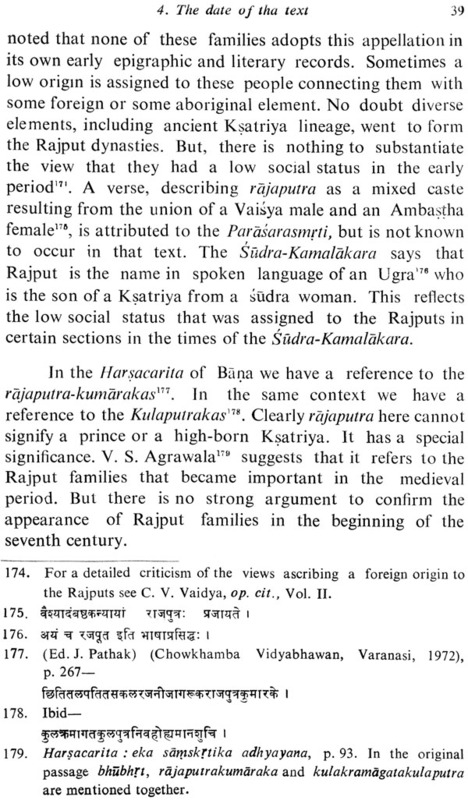 Reference to niti or arthasastra of Brhaspati are handed down to later times. 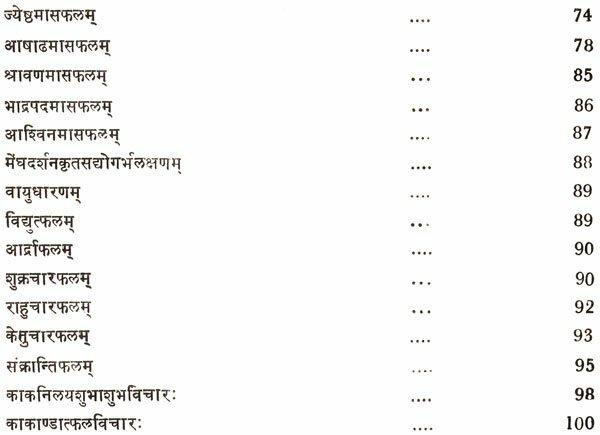 In the sphere of Smrti law Brhaspati occupies a very honoured position with several texts current under his name. It seems that there was a dharmasutra named after Brhaspati which covered vyavahara and other topics of dharma. The original Brhaspatismrti is lost, but its reconstruction on the basis of its verses quoted in later commentaries and digests shows that it was a huge work covering Vyavahara, Samskara, Acara, Sraddha, Asauca, .Apaddharma and Prayascitta, According to Kane, this Smrti was composed between A. D. 200 and 400. There is a smaller Brhaspatismrti in 80 verses. A Dana-Brhaspati has been quoted in the Danaratnakara .The commentaries of Apararka. Vijnanesvara and Devannabhatta- show that there was another Smrti text which was circulated under the name of Vrddha-Brhaspati to distinguish it from the well known Brhaspatismrti. None of the verses appearing in the Gurusamhita occurs in any of the Smrti texts current under the name of Brhaspati. These Smrtis do not deal with the subject covered by the Gurusamhita and do not have any thing common with the Gurusamhita.